FAIRFIELD, Ohio – After a student's suicide rocked the community last year, there are new claims of bullying at Fairfield Middle School and parents plan to protest the school board meeting Thursday. The father of an Asian American girl sent a letter to the Asian American community to ask them to join the protest after he claims a male student bullied his daughter. District and school leaders sat down with the girl's parents and their attorney, Charleston C.K. Wang, to review video of what the family claims is a bullying incident. Fairfield Schools spokesperson Gina Gentry-Fletcher said the fact that school officials met with the parents means the district takes claims of bullying seriously. Because of student privacy, she said couldn't comment on specifics of this case, but added the board will listen to any concerns raised at the Thursday meeting. The latest incident, following Emilie's suicide, shows "a pattern of bullying and harassment directed at Asian-Americans and young girls in particular," Wang said. "We are going to address the school board and respectfully ask them to up the level of vigilance and protection to be afforded against bullying of this nature," Wang said. "Tomorrow this girl's parents will attend the Fairfield School Board Meeting to protest and ask questions...They reached out to the Asian community for help and support. We are called to show solidarity and support by simply showing up at the meeting." 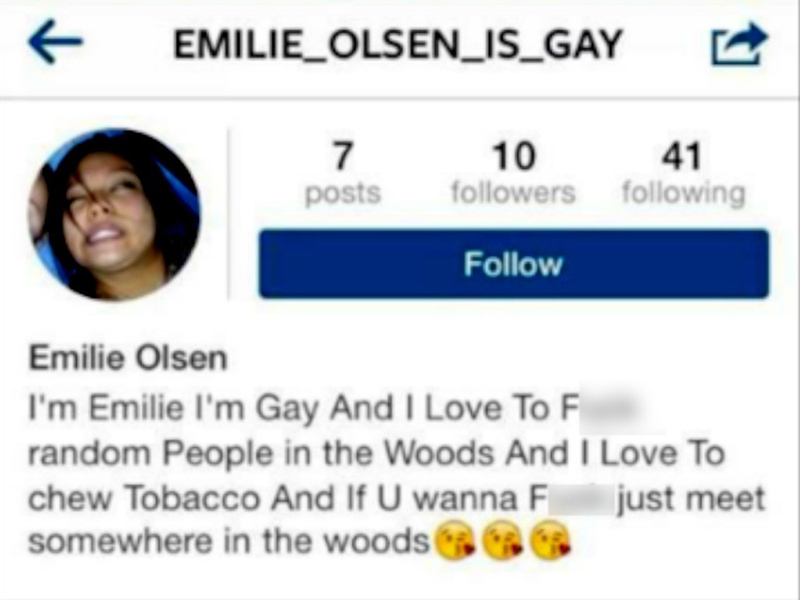 Emilie Olsen's parents say classmates bullied their 14-year-old daughter into shooting herself, but Fairfield officials said they looked into it and concluded that bullying had not played a part in Olsen's death. However, WCPO's I-Team found emails, school reports, a social media account and more that showed the exact opposite was true. The I-Team went to Fairfield Middle School in May to press for more information about the district’s handling of Emilie’s suicide and bullying policies, but Gentry-Fletcher said the administration would not issue an official statement. “We’re done with you,” she told the I-Team. Six months after Emilie's suicide, another Fairfield Middle Schooler came forward and told WCPO she was bullied at the school the previous year and attempted suicide in the summer of 2014. "They definitely have a bullying issue at their school," the girl's mother, Danielle Lewis, said. In both girls' cases, someone set up a fake Instagram account to ridicule them. Before her death, Emilie’s father, Marc Olsen, emailed school administrators and asked about the account mocking his daughter. Sydney's fake Instagram account was titled: “b****yourugly” and mocked her physical appearance. Emilie killed herself on Dec. 11, 2014. She sat in a chair on the second floor of her family’s home, put her father’s gun to her head and pulled the trigger, police said. Eight days later, Fairfield City School Superintendent Paul Otten released a letter to the community that stated there was “no credible evidence that bullying was a factor” in Emilie’s death. After seeing the I-Team’s report in May , Sydney and her mother decided they needed to speak up. They said there were too many similarities between Sydney and Emilie’s school lives that led them to consider suicide. WCPO's Greg Noble, Tom McKee, Jason Law and Maxim Alter contributed to this report.